Scorpia Rising - First Chapter Sneak Peek! The Wise Man's Fear Giveaway Winner! Midsomer Murders - Controversy? Really? The Wise Man's Fear Giveaway! I Have Never.... Lied in a Book Review! An Important Book Has A Release Date!!! Spec Fic Reading Challenge: March Review Link Up! 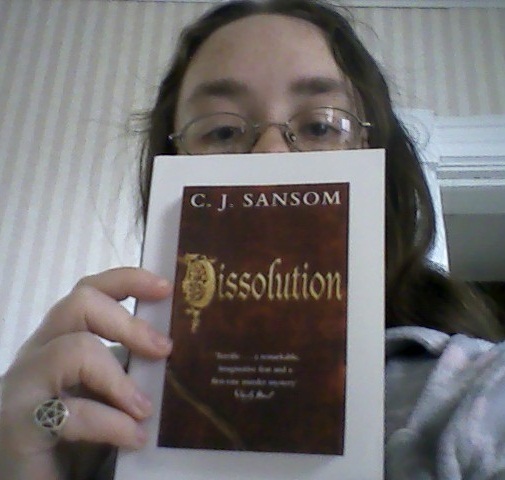 I am loving receiving pictures from the various people who I sent Dissolution to - I really hope they all read and love the book! I kinda want Mieneke's bookshelves too! And, of course, all the books on them! Ugh, bad flyaway hair in my picture, too! Stupid static! Mieneke's shelf wins for having the Erikson Malazan books represented with new covers AND old covers. WIN! I thought I saw a good number of Valdemar books on there!